We are amused by the recent Pig Book of Congressional Spending, if only for its Michigan entries. How about $951,500 by Sens. Carl Levin (D-Mich.) and Debbie Stabenow (D-Mich.), and House appropriator Carolyn Kilpatrick (D-Mich.) for downtown Detroit energy efficient street lighting? In a city with more trouble than it’s worth, this is as good as our elected officials in Washington can do. Well, OK, let’s also give them credit for the the $3.8 million earmark for the Old Tiger Stadium Conservancy , a 501c3 that has already held massive fundraisers. 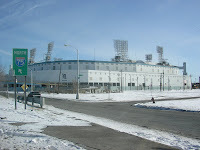 What happens if the effort to save Tiger Stadium fails, despite all the good intentions? That $3.8 million will go somewhere. The bill sits in committee on the Senate side.